You’ve come to the right place for information! We’ve rounded-up all the important announcements and event details Sanderson families need to know. A big thank you to all who participated in our trees for education fundraiser. Our fundraiser was a huge success, bringing sixty-four new spruce trees to our area. We will receive the trees the week of April 22. There is no school on Monday, April 15 through Friday, April 19. School resumes on Monday, April 22. Have a safe and relaxing break! Mark your calendar for our variety show on Sunday, May 5 at 3:30 p.m. We are hoping to have a whole lot of participation from the community, and we encourage entire families to do a performance together. Whether your talents are singing, dancing, magic tricks, acting out a skit, telling jokes, or coming up with other ways to entertain folks, we want to see you perform! Your child needs to be active for an hour every day, and we have some fun suggestions! Show your child it’s good to be active by being active yourself. Children want to do what you do. Find out what activities your child likes or would like to try and then help him do it. Have your child show you the activities they do in school. Do them together as a family. Come up with activities you can do together as a family like going for walks, hiking, biking, rollerblading or roller-skating, playing tag, and throwing the frisbee. Playing sports like basketball, baseball, softball, or tee-ball is also fun! Turn off the TV, or allow only one hour of TV time each day. Limit the amount of time your child spends emailing friends or playing games on the web. Get children to help with housework, walking the dog, gardening, or chores around the house. Encourage your child to play sports and games with friends. Melanie Manley of Worthington, is the recipient of the 2019 Excellence in Teaching Award Winner by the Mohawk Trail Regional School District. Manley has been an early childhood classroom teacher for nearly ten years, and currently teaches preschool at Sanderson Academy in Ashfield, Mass. 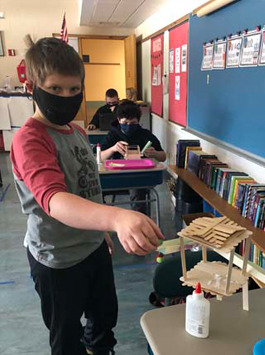 Her classroom instruction includes spending time in an outdoor classroom on the school’s campus to expose students to the multitude of opportunities in the world for hands-on science, art, language arts, multi-sensory, and mathematical experiences. Every day, Manley and her preschool students head outside to expand on play scenarios using the natural environment around them, which enhances their learning and teaches respect for their environment. For more information, please read our March 5, 2019 press release. We are proud to announce that Ms. Melanie Manley has been selected to receive the Harold Grinspoon Award! This is a Pioneer Valley Excellence in Teaching Awards program that annually honors western Massachusetts educators. To find out more, please visit the Harold Grinspoon Foundation website. Congratulations!